Front Row (L to R): Alyssa Jones, Erin Greenlief, Niki Taflinger, Danielle Steck, Jamie Schave & Valerie Barlett. 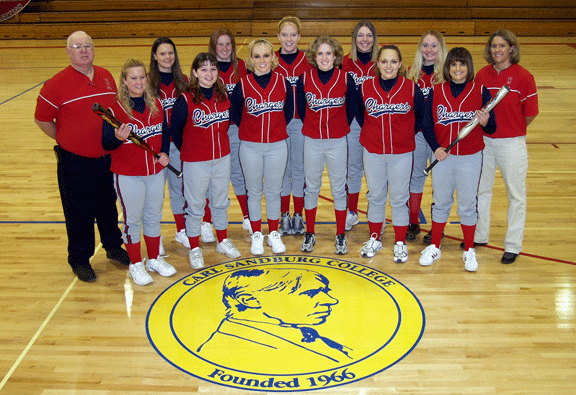 Second Row (L to R): Head Coach Jerry Moshier, Callie Burgdorf, Laura Peterson, Casey Lewis, Brandi McBurney, Dana Morse & Assistant Coach Darcy Swanson. 1 Valerie Barlett 5' 4" 3B Fresh. Galesburg, Ill.
5 Danielle Steck 5' 6" P Fresh. ROWVA, Ill.
10 Jamie Schave 5' 3" C Fresh. Galesburg, Ill.
12 Erin Greenlief 5' 2" OF Fresh. Monmouth, Ill.
13 Dana Morse 5' 6" 1B Soph. Spoon River Valley, Ill.
14 Alyssa Jones 5' 2" P Fresh. Knoxville, Ill.
17 Casey Lewis 5' 10" OF Fresh. Abingdon, Ill.
19 Callie Burgdorf 5' 6" 2B Fresh. Southern, Ill.
22 Niki Taflinger 5' 6" SS Soph. Abingdon, Ill.
44 Brandi McBurney 5' 9" OF Soph. Heyworth, Ill.